Do you have an all-time favourite restaurant? One that consistently delivers incredible food and unbeatable atmosphere, where the staff are charming and the service next to none? How long have you been going there . . . five, ten, maybe even twenty years? Has it evolved with the times and are you still delighted and surprised by each mouthful? I’m not normally one for definitive favourites, for top tens and number ones, but this review carries a lot of weight for me. It’s been a long time in the making. In fact, it was twenty years ago this summer that my seven year old self first trundled along the Italian seafront towards this restaurant, a much littler loaf than I am now, grumbling at my parents that I was tired and hungry, that I wanted to stop for pizza, and why did we have to walk so far when we didn’t really know where we were heading? The answer, of course, was the incredible find that was, and is, Uliassi. Located in Senigallia, a modest resort town in the relatively undiscovered Marche region of Italy, this restaurant is a jewel in the Adriatic crown. Run by brother and sister team Mauro (chef) and Catia (front of house) Uliassi, it embodies everything that is wonderful about Italian seaside cooking, parcelled and presented in two Michelin star-style and streets ahead (in my opinion) of the three starred Madonnina del Pescatore located just down the road. In addition to its stars, Uliassi is also the proud owner of three prized Gambero Rosso forks, placing it high within Italy’s top 20 restaurants in 2011. But it wasn’t always this way. 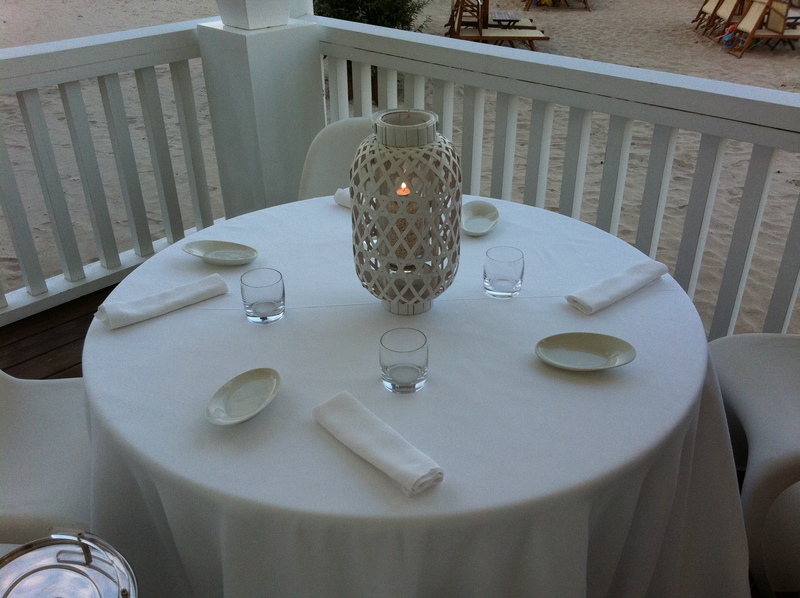 When we first arrived at this restaurant, all those years ago, it was a simple beach front trattoria. The food coming out the kitchen was still completely divine, but had a very different feel; rustic handrolled onion grissini, silky pastas finished in their sauces at the table in little copper pans, plates of deep fried zucchini nestled on greaseproof paper and beautifully fresh fish, served on the bone and studded with tiny roast potatoes and black olives. Fast-forward twenty years and the basics are all still there – the charming staff, the wooden terrace backing onto the beach, the mouth-watering flavours – but magnified to the nth degree. So, what about the food? First up is an amuse bouche to get your tastebuds going, and a little joke from chef Mauro. 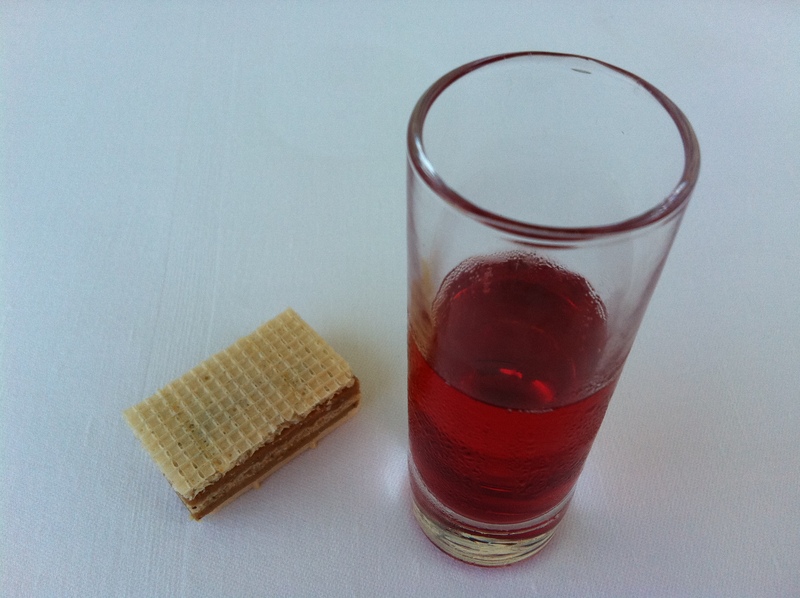 What appears to be an ordinary chocolate tea-time wafer is delivered in tongs by the waiter, accompanied by a tiny shot of kir royale. On closer inspection, the wafer reveals two layers, one of foie gras and the other a sweet, nutella-like praline, iced and flecked with crystals of sea salt. A little fun and a lot of flavour, it sets the tone for the meal perfectly. The first dish in our seven course ‘classics’ tasting menu is a cuttlefish tagliatelle with nori seaweed pesto, served in a glass petri dish. Carniverous Boyfriend and I recently enjoyed something similar at Gelonch, Barcelona, but I’m pretty sure Uliassi were doing it first. 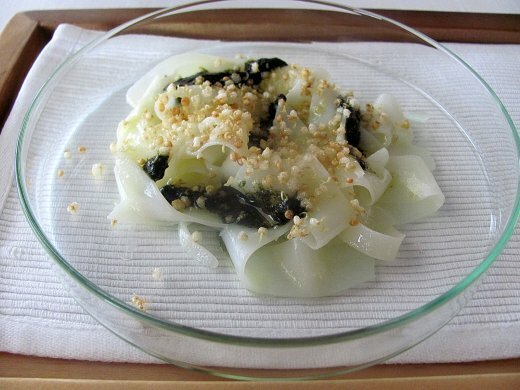 The cuttlefish is creamy and melt-in-the-mouth, the seaweed salty and strong with a crispy crunch of toasted sesame seeds for the ultimate combination of texture and flavour. 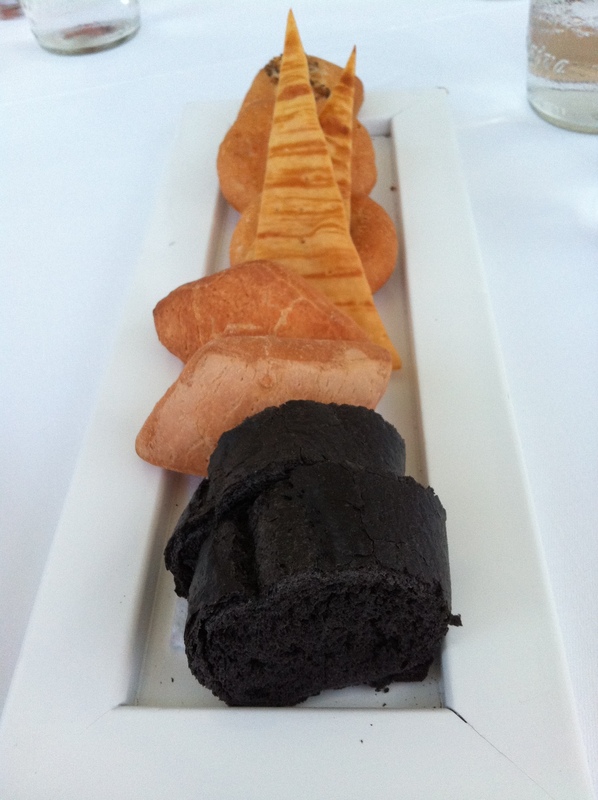 At the same time a beautiful plate of bread arrives; black squid ink baguette, perhaps more stunning in appearance than having any real fishy flavour, bread made with butter which melts like the best savoury croissant you ever tasted, crusty rolls with pork fat, round rolls with baby grilled tomatoes, parmesan and onion grissini and crispy triangles of carta musica. Swoon. Little loaf sighs and goes to heaven . 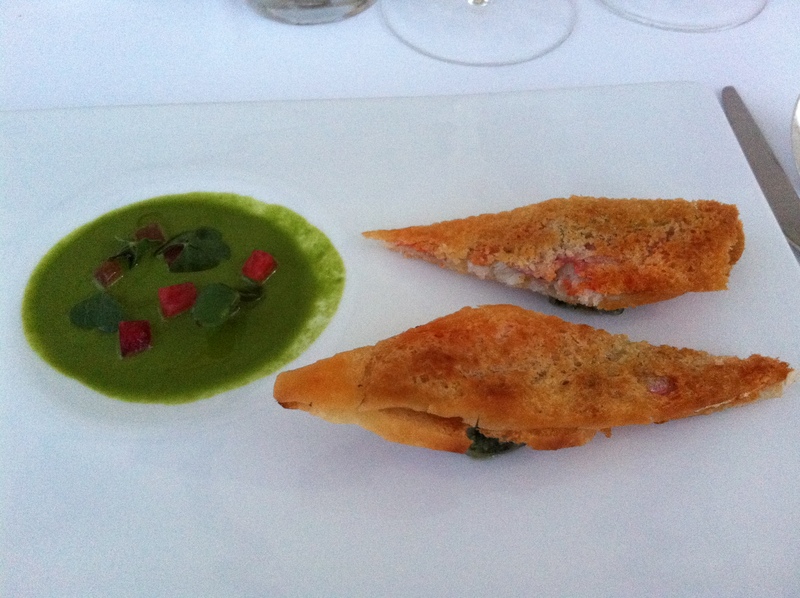 . .
Next up is crispy red mullet with an earthy parsley and anchovy soup. Sandwiched between two triangles of crunchy fried bread, the mullet is rich and creamy – the fish equivalent of an incredible toasted cheese sandwich. Each piece sits on a perfect cannolo stuffed with chard-like wild herbs and works wonderfully with the accompanying puddle of silky green soup. This is followed by a ‘Rimini fest’ skewer. 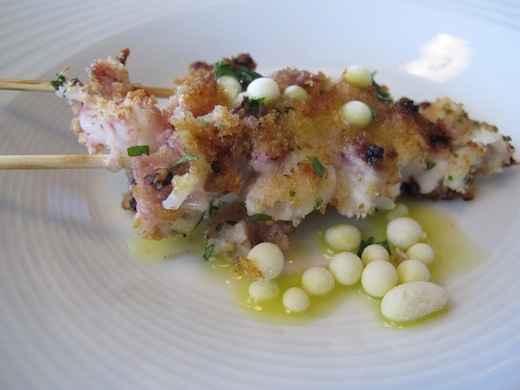 Though seemingly simple, these two brochettes of tender baby squid showcase the complexity of Mauro Uliassi’s chef skills and understanding of flavour. Breadcrumbed, they are also dotted with tiny pearls of salted, iced citrus which disintegrate on impact with your tongue into a cold burst of salty lemon – the perfect accompaniment to the freshest of fish and a playful take on a squeeze of lemon and sprinkle of salt. I didn’t photograph the following course, a dish of puréed potato, teal, wild herbs and black truffle, which appeared like a slick of shiny black tar mixed with squid ink and chocolate in its deep white bowl. It honestly wasn’t intentional, but may have been something to do with the fact that I just didn’t enjoy it. Carniverous Boyfriend and my Dad call me a cheap date; I prefer the soft smooth bubbles of prosecco to champagne’s yeasty fizz, crab to lobster, and I don’t like black truffle. White truffle yes, but I find the funky, pungent earthiness of black truffle completely overpowering. Sorry. Although, for what it’s worth, I can say the potato was smoothed and seasoned to perfection, studded with nuggets of tender teal, and my fellow diners will probably tell me to hang my head in shame. After a palate cleansing iced mojito, half-drink, half-sorbet, and bright with the flavour of freshly picked mint leaves, we move on to the pasta course. 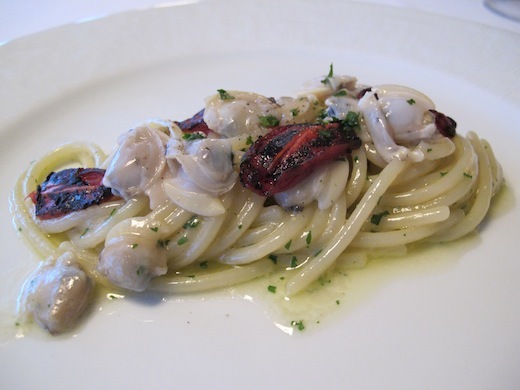 Smoked spaghetti was served al dente in a shiny tangle of tiny clams and grilled baby tomatoes. The sweetness of tomato helped to cut through the smokiness, preventing it from becoming overly rich, although for my taste the flavours and textures were perhaps still a little overpowering. This is an unusual dish, not as light and fresh as a more traditional seafood pasta offering, but interesting and exciting nonetheless. 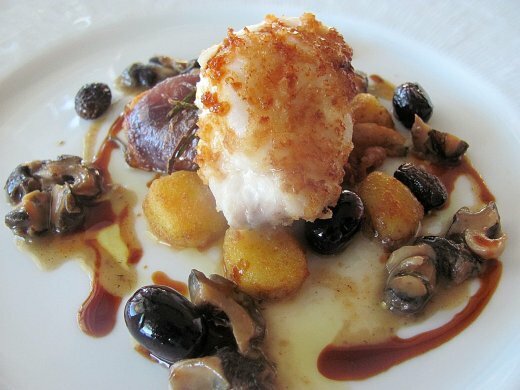 The last of the savoury dishes was a plate of beautifully cooked monkfish, the meaty flesh offset by a rich pigeon sauce and dotted around with tiny, flavour-packed murex and little black olives. Potatoes cooked in goose fat were rich and unctuous, with flavours of red onion and woody herbs coming through, lending it a rounded, hearty finish. While each and every dish at Uliassi is memorable and exceptional in its own way, the pudding, for me, was a particular highlight, and the perfect note to finish on. I’ve eaten this dish on several occasions now, and each time I’m blown away by the combination of flavours and textures. This is tiramisu, but not as you know it. 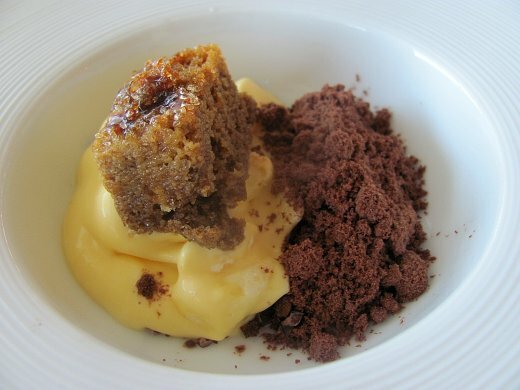 The traditional Italian dessert is deconstructed, leaving you with a syrupy square of booze-soaked sponge cake, an earthy rubble of bittersweet coffee powder and a thick, creamy custard, studded with chunks of crumbly sweet meringue. Eaten separately, each element is exciting and scrumptious, but combine all three and you’re suddenly transported out of this world. If anyone has this recipe, I need it. Although if I had it, I probably wouldn’t know where to start. I imagine the ingredients and techniques required to make this incredible confection would most likely baffle your average home cook. 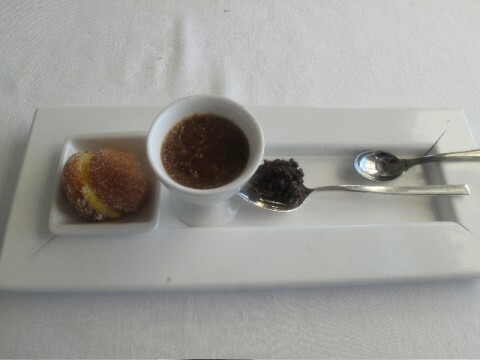 The plate of petits fours which followed certainly would, including a miniature cream-filled doughnut, a perfect egg cup of coffee crème brûlée and a tiny chocolate crisp filled with popping candy. But surely that’s kind of the point of a restaurant like this; food you’d never normally cook yourself, beautifully presented, and in a stunning setting? Uliassi is pushing the boundaries of modern cuisine, but in a charming, Italian way. The menu isn’t strewn with foams-of-this and liquid-nitrogen-cooled-that simply for the sake of theatre; the flavours are recognisable, but surprising, transformed from the everyday to the extraordinary via delicate, subtle additions and combinations. It’s not cheap – the seven course tasting menu will set you back 115 euros excluding wine (we drank a wonderful prosecco followed by crisp, chilled local Verdicchio) – but it’s wonderful. The kind of place you can return to year after year. That always surprises. That never disappoints. And that’s why I love it. If you have a favourite restaurant, I’d love to hear about it. And one of these days, I promise, I’ll have a go at making that tirami…su . . .
As we were eating dinner on the terrace, the light fell come about 9.30pm, making a couple of my photos a little dark and blurred. I’ve therefore taken a few pictures from the great site www.passionegourmet.it where it looks like they ate at lunchtime! Everything looks incredible apart from that weird glass plate. What a place, what a birthday meal. I’m not sure I have a favourite restaurant, but I loved reading about the connection with this place you have. I’ve never eaten anywhere like this and I prefer a more rustic homely feel usually (in interiors and food) and so part of me always assumes people eat at places with Michelin stars and tasting menus because they are somewhere to tick off, not because they genuinely love them. Thanks for challenging me with this review and making me think a bit differently! Wow what an amazing favourite restaurant, you lucky thing! My husband and I will be staying in Fano this May. You can bet your branzino we will be make a trip to Uliassi.